As an industrial candidate looking for a manufacturing or distribution position, the difference between getting the job and not getting the job can really boil down to small details during the pre-employment process. While warehouse interviews typically don’t require a suit and tie or an extensive resume, they do require some very fundamental interviewing skills and preparation. From your resume to interviews, there is a lot that goes on. But we’re here to help. First and foremost, you need to have your resume together. If you haven’t created one, it’s okay to use a template. Be sure to remove or edit all the features of the template so that it looks uniquely yours. When finished, go through it and check for errors and accuracy. Proofreading your resume is key – double and triple check it (and have someone else read through it, too). There are so many times that we receive great resumes but can’t call that person back because the resume has the wrong phone number. Lastly, if you get an interview, bring a neat and crisp copy of your resume – don’t bring a creased, folded or coffee-stained resume! If your application seems like a fit for our position, we’ll give you a phone call to see if it is something you are interested in. Make sure your voicemail is set up. Many people have no idea that they haven’t set up their voicemail, especially if they’ve just gotten a new phone, and can easily miss an opportunity. When you answer our phone call, it is important that we can understand you and hear you clearly. If you’re in a noisy place – or have music playing or the TV on – you should excuse yourself and find a quieter place to talk. We don’t want you to be too early or to be late. Too early and the interviewer will feel awkward leaving you sit for so long. Obviously, arriving late shows that you are not committed to the interview. A happy medium is to show up for your interview 5 to 10 minutes before your scheduled time. If you do arrive early, find a place where you can kill time outside of the office. Our interview process is a video recording with a recruiter. After your interview, these videos are sent to our clients, meaning they will see everything. That includes how you present yourself. If you’re a guy, a good option is to go with a nice button-down shirt with jeans or khakis. A shirt and tie is an added bonus but not expected. As for women, you should wear a nice, non-revealing top with a good pair of jeans or dress pants. On the whole, you want your clothes to be wrinkle-free and clean – and we don’t want to see you in pajamas or sweats. Allow yourself enough time for your interview. On average, it takes about an hour to complete everything needed. Be sure to account for the entire hour and don’t schedule other things around your interview. If you are a smoker, don’t stand in the parking lot and smoke before you come into the office. It isn’t a good first impression if we see you walking into the building and stamping out a cigarette, and even if we don’t see it, we can smell it. On a slightly related note, please do not wear too much (or any) cologne or perfume. You want to smell clean but not overpowering. You never know who you are going to meet or talk with during your an interview. People will come in with an attitude not knowing the person they are speaking to could very well be the one who is helping them land their next opportunity. Everything you do is noted. You want to make a good impression but also be yourself. 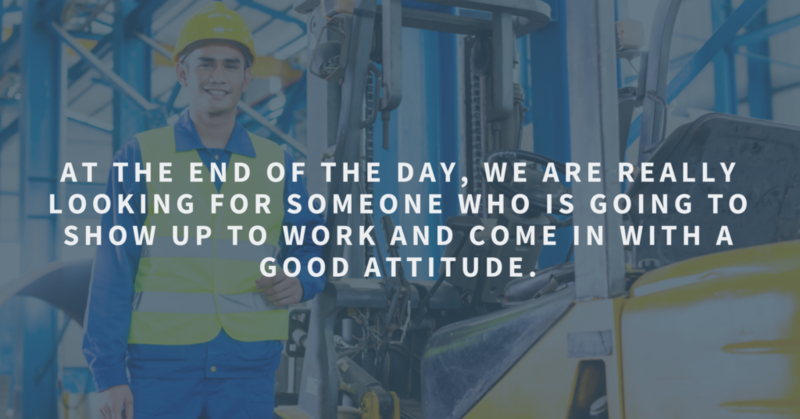 At the end of the day, we are really looking for someone who is going to show up to work and come in with a good attitude. If you do that, it holds a lot of merit in our minds. Get in touch with one of our recruiters today to let us help you land your next job!